Advice for Vegetarian and Vegan travellers – How to survive! Here at the Roaming Renegades we do love our food, but it is quite rare that we bring it up on the blog! There are two main reasons for that, firstly we are pretty poor! And with that comes cutting costs when travelling, which is usually food. Of course, we do eat and we do eat out a few times when we are abroad but it’s often based more around convenience and price and often doesn’t feel like anything to write up about! Secondly we are vegetarians, of course for us this doesn’t mean boring food, far from it, but it does mean we often opt for what is convenient and not necessarily local! For example…eating in an Indian restaurant in Budapest isn’t exactly sampling Hungarian cuisine…but after 2 years of travelling as veggies here are our tips to survive! So, two years ago in October, just after we returned from our honeymoon in Japan, we turned vegetarian. It had been on the cards for a little while, we rarely ate meat and it was after watching the documentary “Earthlings” and purchasing some Quorn one Thursday night we never looked back. If anything I remember an overwhelming feeling of freedom rather than restriction, like a weight I had been carrying for years had come off my shoulders. I won’t go on about ethics, health or the environment, but for us it felt like this was something, as animal lovers, we should have done a long time ago, but we had been denying how we really felt out of convenience. But, as easy as it was in 2013 to be vegetarian at home in England we had given little thought to it until we headed off abroad again! What would we eat? Would it be a constant battle? Well, in fact we found it easier than you might imagine with a bit of forward thinking! Some may say we miss out on some of the culture not eating certain dishes, that may in part be true but for us that isn’t worth sacrificing our morals for. But at the same time we also see and become part of a subculture of a place. Seeking out the vegetarian versions of classic meals and meeting people in cafes, restaurants and shops all over the world who we have this connection to. But at the end of the day we travel not just for the food, but for the sights, the smells, the atmosphere, the people, the history, the architecture and the adventure! Generally speaking cities in most countries tend to be more diverse and also open to new and different things. This means that even in a place where vegetarian options are limited there will usually always be somewhere to eat! There are also usually larger populations of people from other cultures too, for example, an Indian restaurant will almost always serve Vegetarian options due to the religion and culture in India! Some countries are easier than others! Of course, if you are in London or New York you might wonder what the problem is, but if you find yourself in a tiny Chinese village you might feel like your only option is to graze in the fields! It always pays to know a little more about the food culture before you travel. India for example as I mentioned above is one of the best places to travel as a veggie given their religious beliefs. But also consider somewhere like China, quite difficult as a veggie…but call by a temple café and the strict Buddhists are likely to offer vegetarian options. Equally, the west isn’t always as easy as you might imagine, Spain as an example can be quite a challenge, but Hungary and Slovakia were quite easy! As part of our general trip research before we head off to a new city or country we always find a few vegetarian/ or veg friendly places to eat. We look online using either a general search or the website HappyCow. This saves us so much time when we arrive and is also a great way to find places that do traditional meals but with a veggie twist. This way we can try some of the local food too! What we also do is look up what the local dishes are and check what’s usually in them. We had Pierogi in Poland as an example, often it is cooked using suet so we found a few places before we travelled that didn’t use this ingredient! Now, there are two parts to this, the obvious and the not so obvious. Of course, a great way to ensure that you get a vegetarian or vegan dish is to learn the word in the language of the country you are travelling to….often it’s something pretty similar like “vegetáriánus” or “wegetariański”. But… in some countries and cultures the word just doesn’t exist or even the concept! Sometimes it can be interpreted as meaning just no red meat, but assuming chicken and seafood are ok. This is where you may need to do some more lingual research. Learning the words for “No chicken, fish or shellfish” ,”Without Eggs”, “No meat” or “I don’t eat dairy”. Even just knowing the words for “Meat”, “Chicken”, “fish” etc. can be helpful when checking ingredients. I suggest writing all these down in a notebook and carrying it around so you can be clear on what you want. Sometimes it ends up easier to just eat several small meals a day than endlessly searching for a restaurant. This also comes in handy when trying to reduce the budget too, instead sometimes we just have a sandwich, street food and some healthy snacks such as protein bars to keep us going. We are often guilty of being too excited by what the day exploring holds that sometimes we do actually forget to eat! So eating on the move suits us as it saves time and money! 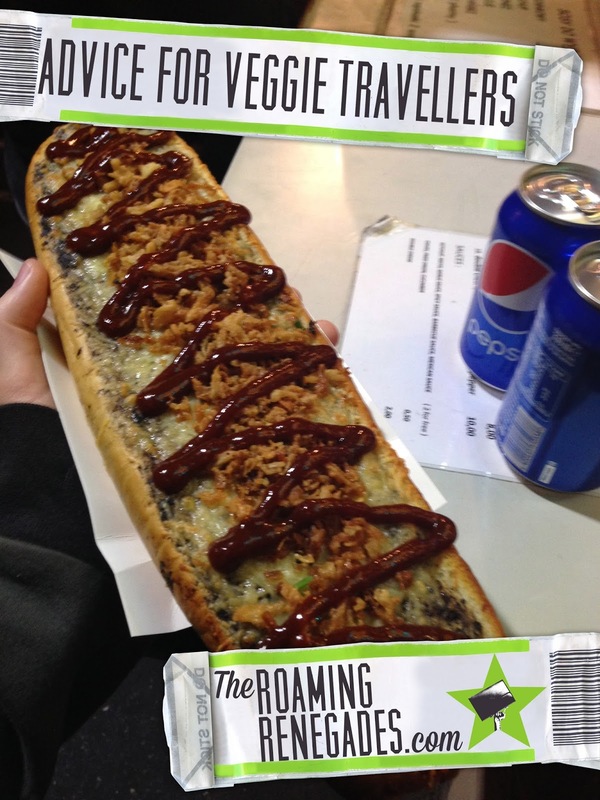 We also discovered our all time favourite food this way…the zapiekanka, in Krakow…as you can see this beast was pretty filling for only £0.90! If you are unsure or struggling then ask around, even the receptionist at your hostel/ concierge at your hotel. Even if they aren’t vegetarian themselves they have a local knowledge of restaurants in the area or might be able to better translate a menu for you. Also, if you manage to find a good veggie restaurant then ask other customers where else you should try. I have also heard some great couchsurfing stories from people who have stayed with fellow veggies! The easiest option to make sure your food is vegetarian or vegan is to cook it yourself. If you are in a hostel or apartment, which we usually are, then this is quite easy. There are often supermarkets, green grocers or local markets where you can buy fresh fruit and veg. Just be sure to check the ingredients like you would at home…and know the names for things like Gelatine or meat based broths. Usually what we love to do when we go out for a meal at night is to wander the streets and discover new places to try out. Sometimes this works out great and we happen across lovely places on a whim. But as a veggie this can be hit and miss and after a while you just want something to eat!! So we usually take note of a few back up options, whether that is an Indian, a veggie café or even McDonalds (many now do veggie burgers, or even just fries!) That does sometimes mean we visit these places a few times but it saves going hungry or getting frustrated! Or, you can always order 2 portions of that veggie starter, a side of roasted vegetables and a plate of chips/fries and make your own meal! Or, at self service counters or salad bars you can usually just fill your plate with the sides! If you’re heading out for the day and you are unsure on the dining options then take a packed lunch with you or a few power bars to see you through. Pack a few lightweight snacks in your bag as an emergency back up in case you get desperate! Familiarising yourself with what is available at short notice is handy too: Which instant noodles are ok for example! Sometimes we have to speak up for ourselves, I mean, if we didn’t we wouldn’t have the wealth of choices we do now! If the menu doesn’t appear to have anything suitable then ask them if they can make it for you or tailor an existing dish so that it is veggie. Most restaurants are flexible with their menus so it’s always worth a try. Also again, try instead of asking for something “vegetarian” ask for something “Without meat, chicken or fish”, it might just be a communication problem! Sometimes when we travel to other countries there can be a culture clash when it comes to food. It is about getting the balance between your moral code and their way of life. We are not there to tell anyone how they live is wrong, especially as guests in their country. But at the same time, we have to be true to ourselves. Sometimes this means finding a polite way to turn down food, or pre warning your host of your needs. Sometimes the best method is to tell people that you get ill if you eat certain things, that way there is no argument, objection or offense. It might seem frustrating but this is where the phrase “choose your battles” ring true! Of course, we take being vegetarians seriously and haven’t knowingly consumed any animal parts since that day in October 2013. But accidents happen, there are communication problems or even an oversight on our behalf. Travelling is about stepping outside your comfort zone and food is part of the challenge. You can try your hardest but don’t be too hard on yourself. Fish sauce in South East Asian cooking is a fine example, and sometimes you might also have to let things slide. We have never knowingly eaten meat or fish, but at the same time, sometimes you have no way of knowing and unless it has big chunks of meat in or it is obvious you might just have to eat it or starve! Or vegetable tempura and sushi came out with some Salmon as side decoration??! !…we just removed it from the plate and carried on! Are you a vegetarian, vegan or have a special dietary requirement? How do you cope on the road? Bookmark this article Advice for Vegetarian and Vegan travellers – How to survive!